BANGI, 20 Oct 2012 – Tuanku Muhriz Ibni Al-Marhum Tuanku Munawir today praised The National University of Malaysia (UKM) for demonstrating that its indigenous foundation and identity is no hinderence to raising its profile to the level of other more established institutions worldwide. The UKM Chancellor congratulated the university’s leadership and staff for their success in raising the university to world-class standards through its various achievements and world class expertise. Tuanku Muhriz who is also the Yang Di-Pertuan Besar Negeri Sembilan said it ranked even better in some of its academic disciplines. He also congratulated Vice Chancellor, Professor Tan Sri Dato’ Wira Dr Sharifah Hapsah Syed Hasan Shahabudin for being selected to lead the 200 member Association of Universities of Asia Pacific come this December. The Chancellor advised graduates receiving their scrolls at the convocation being held from today until Tuesday not to turn their backs on the university when they had successfully joined the various professions. 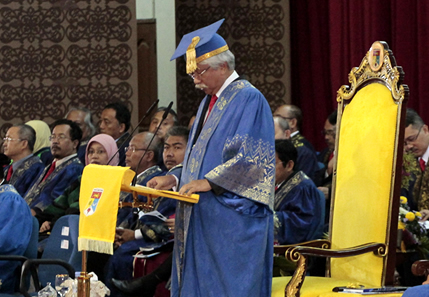 Tuanku Muhriz said they should sincerely contribute to the university whenever they are asked. He also reminded them that learning is a life-long process and with knowledge being dynamic and constantly changing they should be eager to continue the quest for it and explore new endeavors according to their abilities. Tuanku Muhriz also expressed gratitude to the previous Chairman of LPU, Tan Sri Dr Zulkifli A. Hassan, for his contributions to UKM.